“Druck” the bloodhound is buying disruptors. Are you? Has billionaire Stan Druckenmiller been reading RiskHedge? “Druck,” if you don’t know him, might be the greatest investor alive today. Druck strung together 30 straight profitable years from 1980 to 2010. During that time he earned returns of 30% per year. If you took $10,000 and compounded it at 30% per year for 30 years… you’d amass a $26.2 million fortune. And Druck has never had a losing year… ever! He made money in 2001 during the dot-com crash. And reportedly made $260 million in 2008, while most investors were losing their shirts. Regular RiskHedge readers know all about disruptor stocks. Disruptors are not ordinary stocks. They don’t come in and compete with industry leaders. They destroy them. They steamroll the competition… and often hand investors big gains of 3x, 4x, 5x, or better. Remember Xerox (XRX)? It makes those big, clunky paper copiers. 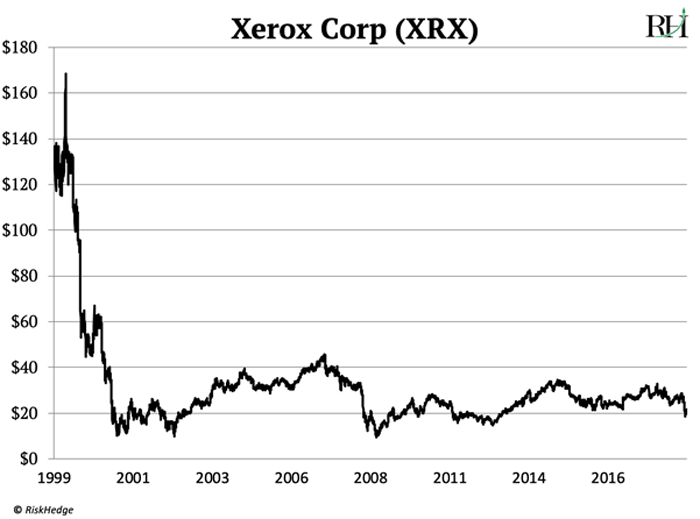 Believe it or not, Xerox was once a mighty tech giant. 30 years ago it was America’s 20th largest company. Today its stock chart is a sad reminder of what it’s like to get steamrolled by a disruptor. Canon (CAJ), one of the world’s biggest manufacturers of printers, is a victim of Adobe’s disruption too. In the past decade printer sales have plunged 30%, and Canon’s stock has been cut in half since 2007. Meanwhile, Adobe stock has surged 600% since 2010. That’s four and a half times better than the S&P 500. And if you’d bought Adobe when it was an “early stage” disruptor in the late 1990s, you’d be sitting on profits of over 20,000%. As I explained recently, the cloud gives businesses cheap access to powerful supercomputers. Druckenmiller has invested over $1 billion in cloud businesses including Microsoft (MSFT)… Amazon (AMZN)… and ServiceNow (NOW). In fact according to SEC filings, 52% of his stock holdings are in cloud companies. 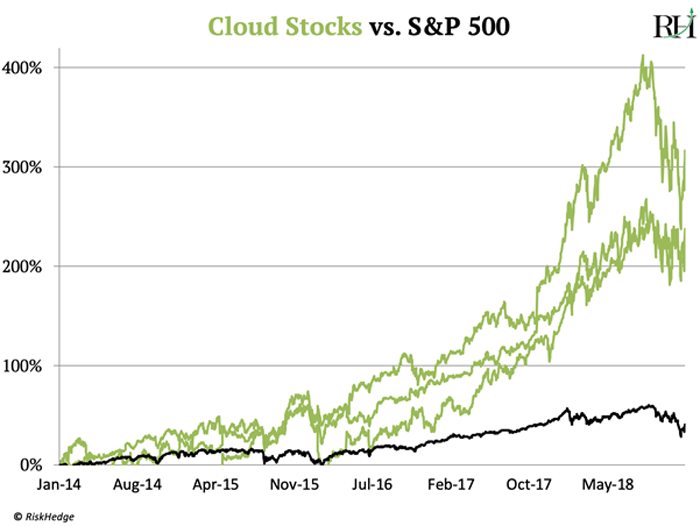 In the chart below, you can see how cloud disruptors have crushed the S&P 500 over the last five years. Have you seen the movie The Big Short? It tells the story of a few investors who made a killing by betting on the US housing collapse in 2007-8. Steve Eisman, who was played by Steve Carrell, was a mastermind behind the trade. His fund made about $1 billion from the housing collapse. 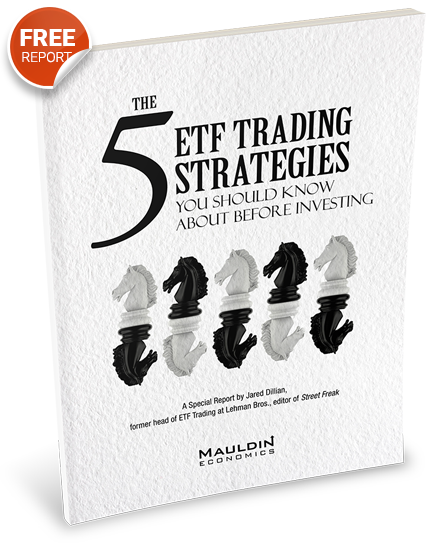 As you may know, many investors got rich by specializing in one strategy. Warren Buffett buys undervalued businesses and holds them forever. Carl Icahn is an “activist” investor. He buys big chunks of companies and influences CEOs to make changes. Neither Druck nor Eisman specialize. Instead, they seek out moneymaking opportunities like bloodhounds. Druck has famously made big money across all assets: stocks… bonds… currencies. Eisman made his fortune during the worst market crash since the Great Depression. You could say they’re agnostic in what they buy. Clearly, these guys know the big money today is in disruptor stocks. I like to see two of the world’s smartest money managers on our side, buying disruptors along with us. Plus I’ll make the case for why one of the world’s largest companies—whose stock you almost certainly own—is in big trouble. Write me at stephen@riskhedge.com with any questions or comments.